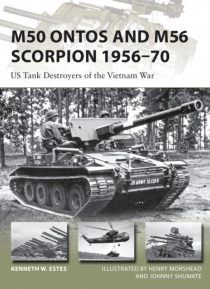 Designed in the 1950s, the US Marines' M50 Ontos and the US Army's M56 Scorpion were both intended to be fast, light, air-droppable tank-killers for the Cold War battlefield an answer to the cumbersome and ineffective World War II-vintage tanks that had taken to the battlefield during the Korean War. Although they shared the aim of bringing light, mobile and lethal antitank firepower to the infa… ntry the two vehicles varied wildly in design to cater for their unique mission demands. They first saw service in the Lebanon intervention of 1958 but it was in the Vietnam War that they made their name, with the M50 Ontos seeing intense combat action in the Battle of Hue in 1968.Detailed illustrations and expert analysis provide the reader with a comprehensive history of these deadly antitank vehicles, from early development through to their combat history and the eventual disbandment of the Marine Corps' last antitank battalion with M50A1s in 1971.